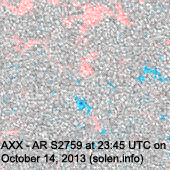 Last major update issued on October 15, 2013 at 03:05 UTC. 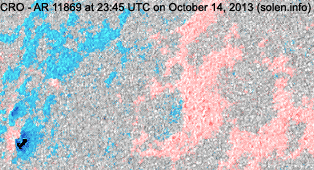 The geomagnetic field was quiet to active on October 14. 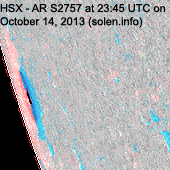 Solar wind speed at SOHO ranged between 274 and 575 km/s under the influence of a high speed stream from CH590. 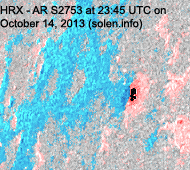 Solar flux measured at 20h UTC on 2.8 GHz was 125.0 (increasing 26.3 over the last solar rotation). 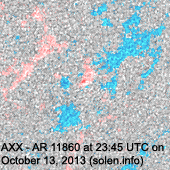 The 90 day 10.7 flux at 1 AU was 112.2. The Potsdam WDC planetary A index was 16 (STAR Ap - based on the mean of three hour interval ap indices: 15.9). Three hour interval K indices: 12233344 (planetary), 02333333 (Boulder). 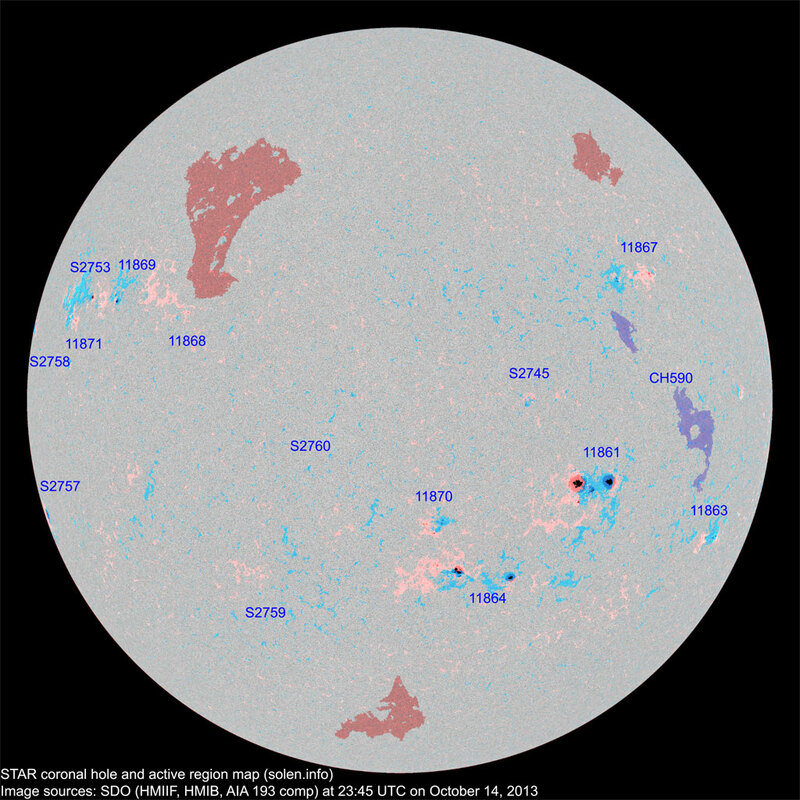 At the time of counting spots (see image time) spots were observed in 14 active regions in 2K resolution (SN: 230) and 11 active regions in 1K resolution (SN: 152) SDO images on the visible solar disk. 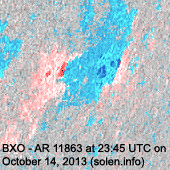 Region 11861 [S09W32] was mostly unchanged. 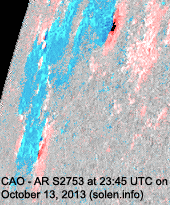 C5+ flare: C7.4 at 23:03 UTC. Region 11863 [S19W62] decayed slowly and quietly. Region 11864 [S23W14] decayed slowly. 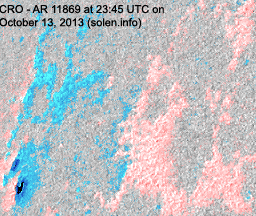 An M class flare is possible as long as the magnetic delta structure remains. 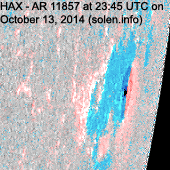 C5+ flare: C8.0/1F at 13:15 UTC. 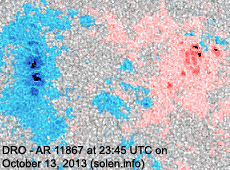 Region 11867 [N23W43] was quiet and stable. Region 11868 [N17E37] decayed slowly and quietly. Region 11869 [N19E51] was mostly unchanged and quiet. 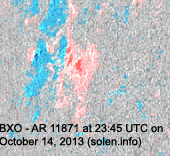 New region 11870 [S15W06] emerged on October 13 and was numbered the next day by SWPC. 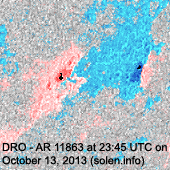 New region 11871 [N14E64] rotated into view on October 13 and was split off from AR S2753. 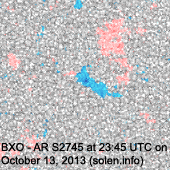 S2745 [N05W21] was quiet and stable. 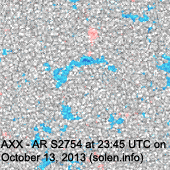 S2753 [N18E59] was quiet and stable, the southeasternmost spots were split off into AR 11871. 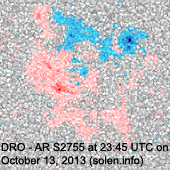 New region S2757 [S17E83] rotated into view. 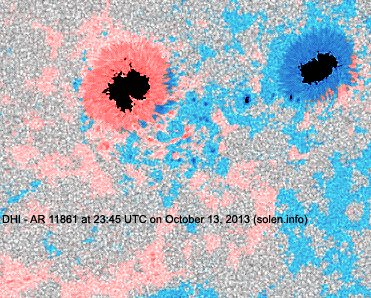 New region S2758 [N11E81] rotated into view. 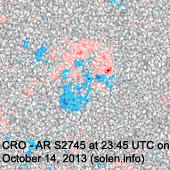 New region S2759 [S27E25] emerged with a penumbra spot. New region S2760 [S05E25] emerged with a penumbra spot. 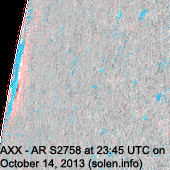 October 12, 14: No obviously Earth directed CMEs were observed in LASCO and STEREO imagery. 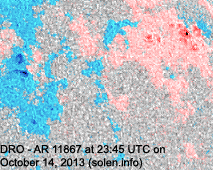 October 13: A partial halo CME was observed after an M1 flare in AR 11864 early in the day. 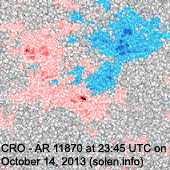 There is a 20-30% chance the CME could reach Earth late on October 15 or on October 16. 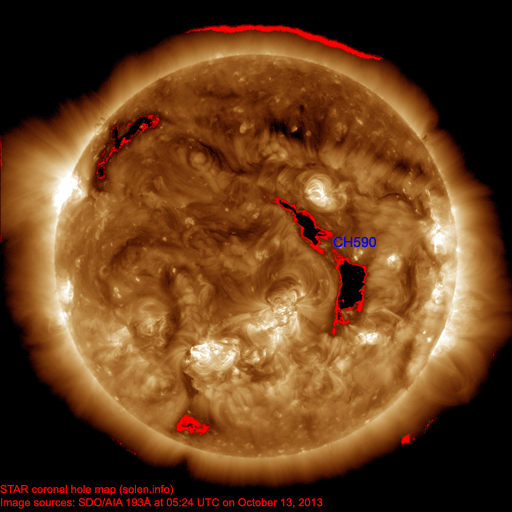 A recurrent trans equatorial coronal hole (CH590) was in an Earth facing position on October 11-12. 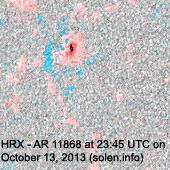 The geomagnetic field is expected to be quiet to active on October 15 due to effects from CH590. 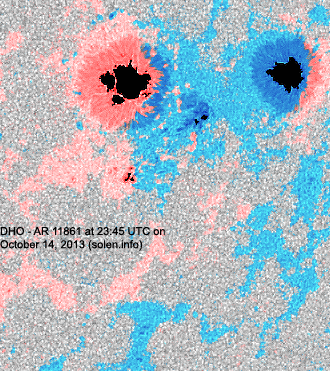 If the CME observed early on October 13 reaches Earth, unsettled and active intervals will be possible on October 16, otherwise quiet conditions are likely. 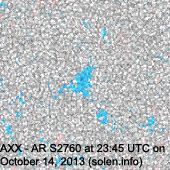 Quiet conditions are likely on October 17.